From a joyful Sunday came a productive Tuesday! Weenta and I worked together on the set for her documentary project, which concerns stereotype threat. But, wait! "What the hell does that mean?" Weenta asks. She gives a sober answer. This week included a joyful Easter Sunday! Family came to town! Or as she likes to refer to herself, “[Julia's] future mother-in-law.” Family matters aside, the three of us had a blast! Easter Sunday turned into a real adventure. Only in New Orleans, right y'all? But for real. Rare is it that an afternoon in the French Quarter is so fun (given I'm a homebody and us, locals, tend to let the city's visitors enjoy the Quarter). Sunday was that. Sunday was great. Sunday was so fun! Together, the three of us hit up 2 Easter day parades. I documented the experience. Check it out! "The three of us had a blast! Easter turned into a real adventure. Of course. Only in New Orleans." - Julia Elizabeth Evans, Friday, April 21, 2017. Video created Sunday, April 16, 2017. Weenta asks Dr. Anderson Sunda-Meya, “Could you define, in your own words, what is stereotype threat?“ Dr. Sunda-Meya is Norwood Professor of Physics and Director of Dual Degree Engineering Program at Xavier University. From a joyful Sunday came a productive Tuesday! Weenta and I worked together on the set for her documentary project, which concerns stereotype threat. The project navigates the behavioral science behind stereotype threat, specifically as it affects Black engineers in academic and professional settings. Stereotype threat is a situational predicament in which people are or feel themselves to be at risk of conforming to stereotypes about their social group. Tell me about a time you felt ignored or overlooked academically because of your race. Tell me about a time you felt judged in an academic setting because of your race. Shooting went well. Special thanks goes out to Thomas Walsh - Love You Back Productions' audio engineer extraordinaire. Weenta asks Temple Price, "Tell me about the first time you heard of the term stereotype threat--and how did that term resonate with you?" Price is a graduate student at Xavier University. Her research concerns stereotype threat. - Video still from Julia's camera on Tuesday, April 18, 2017. “For now, feel the experience by way of some video stills.” - Julia Elizabeth Evans, April 21, 2017. Video still from Wednesday, April 19, 2017 shoot. "But, alas, I applied deductive reasoning and figured what was going on." - Julia Elizabeth Evans, April 21, 2017. Video still from Wednesday, April 19, 2017 shoot. -“Hey, can I borrow a tripod?” Anuraag. -“Sure, what for?” Julia. -“Maison. 4:30-6:30," Anuraag. That was it. That was the only information he gave me. But, alas, I applied my deductive reasoning skills and figured out what was going on. Anuraag wanted to film his performance. He wanted to film his performance on his own, by himself. I’m thinking...Does Anuraag even have a camera? No. He doesn't. He wanted to film his performance on his own, by himself, without a camera. I'm thinking....???? On a whim, I decided show up and do the heavy lifting. As in, I decided to shoot the damn thing for my buddy. Wednesday evening, I recorded Anuraag with his band, Claire and Company, at Maison on Frenchmen Street. Anuraag is the piano player. The performance was spectacular. Look out for video of the performance in two weeks. For now, feel the experience by way of some video stills. “He hits me up on Wednesday, ‘Hey, can I borrow a tripod?’” - Julia Elizabeth Evans, April 21, 2017. Video still from Wednesday, April 19, 2017 shoot. Thursday proved as productive as Wednesday and Tuesday. Love You Back Productions had back-to-back meetings in the Central Business District. One 9am. One 10am. Luckily, these meetings were blocks from each other. To be sure, Weenta counted. Our 9am was exactly 7 blocks down the street from our 10am. Thank the Lord! Image from Mia Bella Beauty Lounge Facebook page. While one of two video projects is still nascent, the other is ironed-out. Love You Back Productions is set to produce a beauty campaign of 3 films for Mia Bella Beauty Lounge. 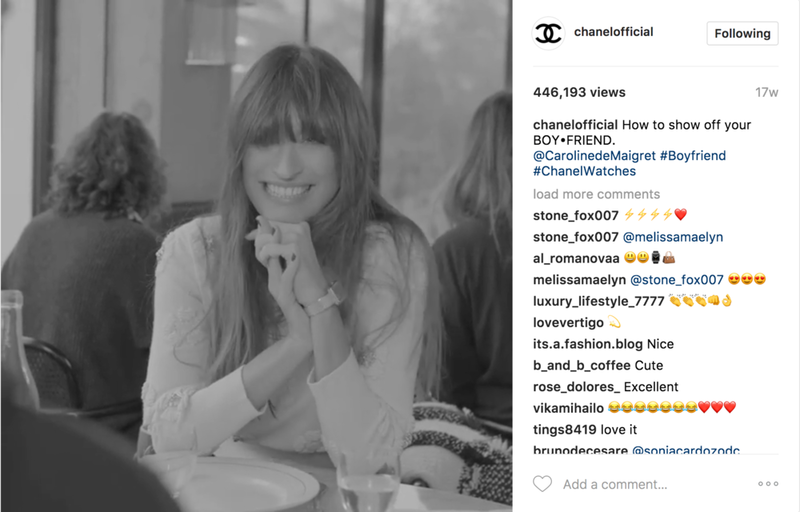 Our inspiration is Chanel instagram account. For a beauty campaign, who else could it be? "Of course, y’all know. ....We’re all about thoughts and feelings over here at Love You Back Productions." - Julia Elizabeth Evans, Friday, April 21, 2017. Of course, y’all know. That kind of stuff resonates with us. We’re all about harmony and support over here at Love You Back. Until next week! Our motto is share more stories.